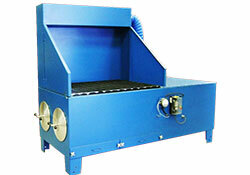 Our DownDraft Table DYNA FLO is an equipment for polishing and finishing operation. It has a downflow and distributed evenly in order to capture fines worked material. This custom equipment is designed for maximum operator comfort, plus it has a silencer on the back, this system provides a clean work area for more efficient operation.